Breeding dogs has been my greatest passion for almost 20 years. I have bred Yorkshire Terrier since 1996. This is my way of life. Having healthy, cheerful dogs, is the aim of my breeding. I'm a member of Polish Kynological Federation which is the member of FCI. I started my adventure with Yorkshire Terriers with buying a beautiful dog from a very well known polish breeder - Mrs Anna Zwolińska (Bakarat FCI). I was impressed with her vast knowledge, experience and the magnificent dogs. My decisions through all those years generated a specific type of small dogs with beautiful, sweet short muzzle, good proportions and ideal hair. I keep the breed standard as the guideline for the breed specific features. I also cooperated with Katarzyna Stasiak - "Yorex" breeder. Kasia is unquestioned authority for me. The experience acquired over the years of working with dogs convinced me that only the professional approach and the serious treatment of what I do is the only road to success. My education is also strictly connected with dogs and kynology. My MA thesis theme was "Hunting dogs". I work for Bydgoszcz division of Polish Kynological Federation. 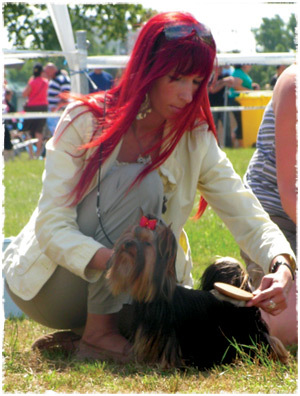 I organize Yorkshire Terrier Dog Shows in Bydgoszcz every year. Yorkshire Terriers and Chihuahua from my breeding find their home in Poland and abroad. Dogs from Lazuryt breeding live in USA, Canada, France, United Kingdom, Austria, Germany, Belorussia, Sweden, Norway, Cyprus and Italy. I had many successes on national and international dog shows. I have constant contact with my customers and their puppies. I try to help them whenever they have problems with their dogs or any questions regarding puppies health and care. My dogs live with us at home. They have two rooms (19 m2 and 30 m2) for themselves and a big garden. Puppies are fed with Royal Canine Starter and meat. Adult dogs eat natural food -the base is chicken meat and meat and vegetables, they also eat Hills feed with lamb and rice. I spent a lot of time playing and teaching puppies. I believe it causes they are in good shape and mental condition. Welcome to my website.